Current management comprises intravenous (IV) broad-spectrum antibiotics and image-guided percutaneous needle aspiration (PNA) or percutaneous catheter drainage (PCD). Percutaneous drainage of liver abscess has been a significant innovation in the treatment of liver abscesses. Presently, indications for surgical drainage comprise unapproachability or multiple abscesses that cannot be drained percutaneously or unsuccessful percutaneous drainage. Some authors consider that PCD is more successful than PNA in the treatment of liver abscess, on the other hand, some studies have revealed that therapeutic needle aspiration to be a easier, cost-effective, and equally efficient method of treatment.,,, Consequently, there is a debate about the first line of management of liver abscesses, especially in developing countries, where infections including liver abscesses are common, and the majority of the patients are from lower socioeconomic strata. Therefore, the main aim of this study is to analyze and to equate the clinical outcome of percutaneous ultrasound-guided catheter drainage with intermittent needle aspiration of pyogenic liver abscesses. This study was a single-center prospective randomized comparative study and included a total of 66 patients. These patients were randomized into two groups; PNA (n = 33) and pigtail catheter drainage (PCD) (n = 33) which was inserted using the Seldinger technique. This study was approved by the Institutional Ethics Committee, and written informed consent was obtained from all the participants. 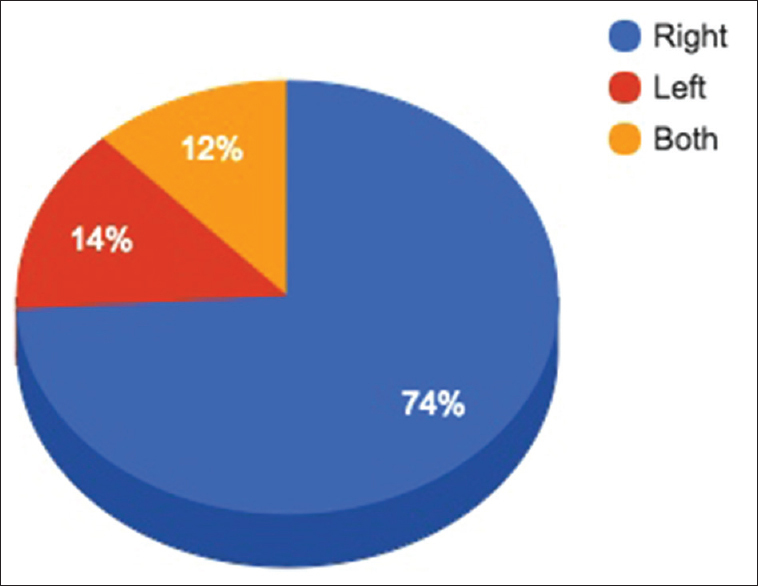 All the patients that visited the outpatient and emergency departments of the hospital and subsequently identified to have liver abscesses clinically and radiologically (on ultrasonography and/or CT scan) were incorporated in the study. All the age groups were involved with following exclusion criteria's: preceding liver intervention; ruptured abscess; indeterminate diagnosis; associated biliary tract malignancy; and uncorrectable coagulopathy. All the participants fulfilling the inclusion conditions were worked up with regard to a comprehensive history, clinical checkup, and laboratory/imaging examinations. An informed consent was taken from the participating patients, and all the agreeable patients were given medical treatment as per our protocol. Randomization was carried out by means of computer software, agreeing to a standardized earlier reported protocol. The two sets of random numbers produced by the software were allocated to the two intervention groups, and numbered envelopes (sealed) were prepared with the serial number cited outside and intervention stated inside by a nonparticipating person. When the participating patient gave a legitimate consent, the specified intervention was done. The PCD was done by the introduction of a 12 Fr pigtail catheter in the abscess cavity under ultrasound guidance utilizing the Seldinger technique. The patient underwent ultrasound of the abdomen, and the features of the abscess cavity were documented. Local anesthetic was permeated in the intended area of puncture. Employing a sterile blade a minor stab was made on the anesthetized skin. A percutaneous pigtail catheter set having a 12 Fr catheter was utilized for drainage. Under real-time ultrasound guidance, the puncture needle was introduced through the skin stab and directed to the middle of the abscess cavity. The stylet was removed, and pus was aspirated to reconfirm the location, and the aspirated pus was transmitted to the laboratory for examination. A guide wire was introduced through the needle, and the needle was withdrawn without dislodging the guide wire. The tract was widened with plastic dilators one after the other up to 12 Fr size. The 12 Fr pigtail catheter was then introduced over the guide wire into the abscess cavity and the later was withdrawn, and the catheter was secured to the skin using suture. The catheter was fixed to a collecting bag by the connector, which was supplied along with the catheter set. Apart from documenting the clinical and laboratory details of the patient every day, the day-to-day output of the catheter was also measured. A decision to withdraw the pigtail catheter was made in case the overall drainage from the catheter diminished to <10 mL/24 h for two successive days. Aspiration of pus was done under ultrasound guidance using an 18 Gauge disposable trocar needle and 50cc syringe. In multiloculated abscesses, the needle tip was introduced into different loculi for thorough removal of pus. Repeat ultrasound was performed every 4th day, and the dimensions of the residual cavity were recorded. The clinical outcome and laboratory parameters were documented on a daily basis. In the patients who underwent PNA, sonography was again done after a period of 4 days and aspiration repeated in case the cavity size was still found to be larger than 50% of the original size. The identical procedure was again done after a period of another 4 days and aspiration repeated if necessary. The failure of clinical relief with respect to fever, pain, tenderness, and leukocytosis or reduction in dimensions of the abscess cavity following a third attempt of aspiration was considered as unsuccessful needle aspiration. In such patients, open surgical drainage of the abscess cavities was done. Data of the following outcomes were documented, analyzed, and compared between two intervention groups: success percentage; period of hospital stay; complications related to the procedures; days to attain clinical relief; days to accomplish a 50% decrease in the dimensions of the abscess cavity; and days to realize total or near-total resolution of the abscess cavity and mortality. The criteria for an effective percutaneous intervention were defined as the sufficient drainage of the abscess to attain the resolution of infection without the necessity for surgical drainage and with the consequent discharge of the patient from the hospital. Clinical relief was defined as the resolution of fever, a normal leukocyte count, and the respite from local signs and symptoms after effective PCD or PNA. The patients were followed up every week for a month and for every month for 6 months, for clinical assessment and sonographic evaluation of the abscess cavity till entire resolution of the abscesses was accomplished. Data were documented and analyzed by the researcher. The success of both techniques was calculated and compared with respect to the period of hospital stay; days to attain clinical relief; days to realize 50% decrease in abscess cavity dimensions; and days to realize the total/near-total resolution of abscess cavity. Independent t-test was employed to evaluate these parameters. The level of statistical significance was fixed at P < 0.05, and range and mean values were computed. A total of 66 patients randomized into two groups of 33 each were involved in the study. The following interpretations were made. The age of the patients ranged from 18 years to 65 years with majority of the patients falling within the age range from 40 to 50 years (n = 28). The second most common age group was 31–40 years (n = 15 patients) that was followed by 21–30 years (n = 10 patients). Majority of the patients were males (n = 55) with females accounting for only minority of the participants [Table 1]. Right upper quadrant pain of the abdomen was the most frequent symptom, which was followed by fever. Other symptoms comprised anorexia, generalized weakness, weight loss, night sweats, pain in the right shoulder region, and cough. On clinical examination, hepatomegaly and mild jaundice were common findings whereas pleural effusion was found in only seven patients [Table 1]. Majority of the patients had leukocytosis, elevation of serum alkaline phosphatase, and positive amoebic serology [Table 1]. On the other hand, pus cultures were found to be positive in only one-third of the cases with majority of them revealing Escherichia More Details coli. Amebic liver abscesses were most commonly seen that was followed by pyogenic abscesses. The abscesses in majority of the patients were located in the right lobe of liver along with a solitary abscess cavity [Figure 1]. It was seen that the diameter of the abscess cavities varied between 35 and 160 mm [Table 2]. A total of 66 patients underwent one of these two percutaneous methods randomly, and their outcomes to treatment were documented and analyzed. Pigtail catheter drainage was efficacious in all the 33 cases, in contrast, the ultrasound- guided needle aspiration was effective only in 20 of 33 patients, and the difference was statistically significant (P < 0.05). Out of these 20 patients effectively treated by PNA, 14 patients needed only one aspiration, 4 needed two aspirations, and 2 needed three aspirations. The 13 patients who did not demonstrated clinical improvement and/or reduction in abscess cavity size even after three aspirations were labeled as failures. The median period of catheter isnsertion was 10 days (range 7–21 days, average 10.4 days). The average duration of IV antibiotics and time to clinical improvement were smaller in the PCD group as compared to the aspiration group, and that was statistically significant (P < 0.05). No major complication was seen in either of the groups. In the PNA group, the mean longest span of the abscess was significantly more (11.8 ± 3.2 cm) in patients with ineffective than in patients with efficacious (4.9 ± 2.0 mm) needle aspiration (P = 0.03). The mean volume of abscesses (320 ml) in the 13 patients in whom PNA was ineffective was significantly (P = 0.04) greater than the mean volume (160 ml) of the abscesses in the 20 patients in whom 1st or 2nd or 3rd aspirations were effective. Intermittent needle aspiration was efficacious for all patients with abscesses up to 4.5 cm in longest diameter. Nevertheless, this treatment was futile for three patients who had multiloculated abscesses. The average size of abscess at hospital discharge was 3.5 cm in catheter group and 4.8 cm in needle aspiration group, which was statistically significant (P < 0.05). 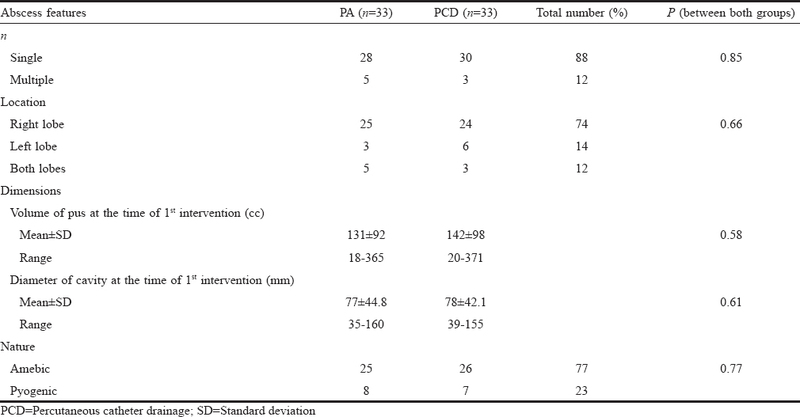 All the patients were treated efficaciously by PCD (n = 33) had overall ultrasonographic resolution of abscess cavities, compared to only 20 patients treated by PNA (P < 0.05) at 6 months of follow-up with no relapse seen in either of the groups on follow-up. Nevertheless, there was no statistically significant difference among the successfully treated cases of the two groups regarding the period of hospital stay or the time needed for total or near-total resolution of the abscess cavity [Table 3]. In the present era of minimal invasiveness, percutaneous interventions have become the desired method for the management of liver abscess. We did ultrasound-guided percutaneous interventions in 66 patients with uncomplicated liver abscess and got decent outcomes. There was no mortality or any significant complication necessitating any action. A number of investigators have used both the procedures, with variable degrees of success and have revealed that the combination of IV antibiotics and image-guided percutaneous interventions (PCD and PNA) are efficacious. The aim of this study was to establish which method is better. Whether to do PCD or PNA continues to be debated especially in developing countries where not all patients are affording to undergo costly procedures. Only few earlier prospective randomized clinical studies have compared PNA with PCD. All these studies encompassed abscesses of all the dimensions. The study done by Yu et al. involved the patients with pyogenic abscesses only and revealed no significant difference in the outcomes of the two techniques. They determined that PNA was perhaps as successful as PCD. They endorsed PNA as a first-line method owing to procedure ease, patient comfort, and low price and recommended a multicenter study to offer a conclusive solution. In the study done by Rajak et al., the authors concluded that catheter drainage was better with respect to success rate; however, they restricted the number of needle aspirations to two and that may be a cause for inferior success rate (60%) of percutaneous aspiration. Zerem and Hadzic in their study endorsed PNA for simple abscesses of 5 cm or lesser in dimensions. Similar to study done by Zerem and Hadzic we did maximum of three attempts of PNA as 14 out of 20 patients had effective drainage after the first attempt and only four in the second attempt. The third stab was effective in only two patients out of 20. This corroborates that repeated needle aspiration is rarely successful. On the other hand, the results of our study confirmed that repetitive PNA and PCD are equally efficient in the management of liver abscesses 45 mm or less in the longest diameter. As documented in previous studies, PNA of all multiloculated abscesses was unsuccessful in our study also, and in such cases, PCD should be the preferred intervention. A small number of studies also state that the initial size of the abscess cavity does not influence the final result. On the other hand, Rajak et al. considered that large abscesses are more challenging to aspirate entirely in a single try and favored PNA for abscesses <5 cm, and PCD for bigger abscesses. In dissimilarity to few of the former studies that revealed that the original size of the abscess cavity did not influence the final result; we found that bigger abscesses are harder to evacuate totally in one attempt, requiring successive aspirations. The mean volume of the 13 patients in whom PNA was unsuccessful was significantly greater than the mean volume of the patients who could be efficaciously treated with PNA. Incapability to totally evacuate the thick viscous pus and quick reaccumulation of pus in such abscesses are other additional reasons, which have been described in literature for failure of needle aspiration. Introduction of an indwelling drainage catheter tackles all three of these concerns as it offers uninterrupted drainage, evacuates thick pus owing to broader caliber catheter, and avoids reaccumulation. On the basis of earlier documented results, we omitted patients with concomitant malignant biliary disease, which are a poor prognostic factor and the important reason of mortality among patients with liver abscesses. This might be the reason that we had a superior overall success rate with percutaneous interventions, especially PCD, than previous studies and is possibly why there were no mortalities in our series. Since our institution is a tertiary care referral hospital, several patients had been incompletely managed with antibiotics before being referred to us; this perhaps explains the fact that many abscesses had negative results of pus cultures in the present study. Period of hospital stay and time interval required for the resolution of abscess cavities in effectively treated patients did not significantly differ in both PNA and PCD groups and is similar to the findings of previous studies. Furthermore, no relapse happened in any of the successfully treated cases in both groups during the 6-month follow-up period. Baek et al. and Giorgio et al. have documented a considerable lesser frequency of complications with PNA than with PCD as one of the major benefits of PNA over PCD. Yu et al., in their study, had documented five mortalities (four in the PCD group and one in the PNA group) while Singh et al. described one patient, in the PCD group, who experienced abscess rupture and expired. These results are different from the findings of the current study, which indicate no significant difference between PNA and PCD. We feel that the complications of these procedures depend on the experience and precision of the healthcare professional performing these procedures apart from underlying comorbidity conditions that the patients might be having. Ultrasound-guided percutaneous drainage (PCD) is better than intermittent PNA in the treatment of liver abscesses; however, the latter is a suitable substitute in abscesses cavities that are 45 mm or less in longest dimensions. On the other hand, PNA is not effective for multiseptated liver abscesses for which PCD should be the preferred option. Branum GD, Tyson GS, Branum MA, Meyers WC. Hepatic abscess. Changes in etiology, diagnosis, and management. Ann Surg 1990;212:655-62. Sharma MP, Ahuja V. Management of amebic and pyogenic liver abscess. Indian J Gastroenterol 2001;20 Suppl 1:C33-6. Seeto RK, Rockey DC. Pyogenic liver abscess. Changes in etiology, management, and outcome. Medicine (Baltimore) 1996;75:99-113. Cai YL, Xiong XZ, Lu J, Cheng Y, Yang C, Lin YX, et al. Percutaneous needle aspiration versus catheter drainage in the management of liver abscess: A systematic review and meta-analysis. HPB (Oxford) 2015;17:195-201. Wong KP. Percutaneous drainage of pyogenic liver abscess. World J Surg 1990;14:492-7. Saraswat VA, Agarwal DK, Baijal SS, Roy S, Choudhuri G, Dhiman RK, et al. Percutaneous catheter drainage of amoebic liver abscess. Clin Radiol 1992;45:187-9.
vanSonnenberg E, D'Agostino HB, Casola G, Halasz NA, Sanchez RB, Goodacre BW. Percutaneous abscess drainage: Current concepts. Radiology 1991;181:617-26. Funaki B. Catheter drainage: Seldinger technique. Semin Intervent Radiol 2006;23:109-13. Urbaniak GC, Plous S. Research Randomizer. Computer Software. Ver. 3.0. Available from: http://www.randomizer.org. [Last retrieved on 2017 May 05]. Zerem E, Hadzic A. Sonographically guided percutaneous catheter drainage versus needle aspiration in the management of pyogenic liver abscess. AJR Am J Roentgenol 2007;189:W138-42. Singh O, Gupta S, Moses S, Jain DK. Comparative study of catheter drainage and needle aspiration in management of large liver abscesses. Indian J Gastroenterol 2009;28:88-92. Singh S, Chaudhary P, Saxena N, Khandelwal S, Poddar DD, Biswal UC, et al. Treatment of liver abscess: Prospective randomized comparison of catheter drainage and needle aspiration. 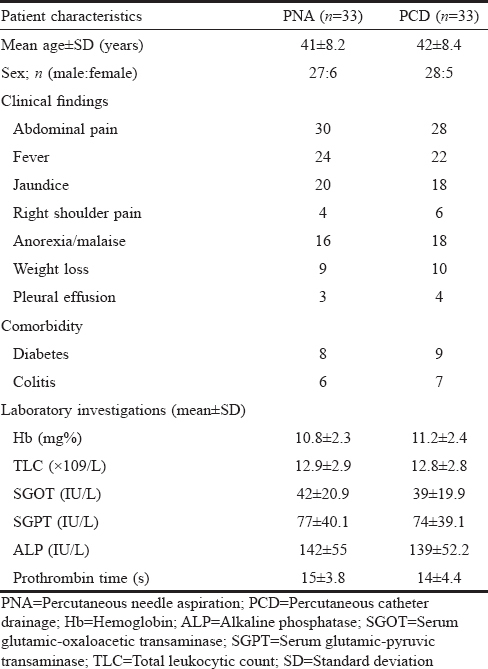 Ann Gastroenterol 2013;26:332-9. Yu SC, Ho SS, Lau WY, Yeung DT, Yuen EH, Lee PS, et al. Treatment of pyogenic liver abscess: Prospective randomized comparison of catheter drainage and needle aspiration. Hepatology 2004;39:932-8. Rajak CL, Gupta S, Jain S, Chawla Y, Gulati M, Suri S, et al. Percutaneous treatment of liver abscesses: Needle aspiration versus catheter drainage. AJR Am J Roentgenol 1998;170:1035-9. Baek SY, Lee MG, Cho KS, Lee SC, Sung KB, Auh YH. Therapeutic percutaneous aspiration of hepatic abscesses: Effectiveness in 25 patients. AJR Am J Roentgenol 1993;160:799-802. Giorgio A, Tarantino L, Mariniello N, Francica G, Scala E, Amoroso P, et al. Pyogenic liver abscesses: 13 years of experience in percutaneous needle aspiration with US guidance. Radiology 1995;195:122-4.